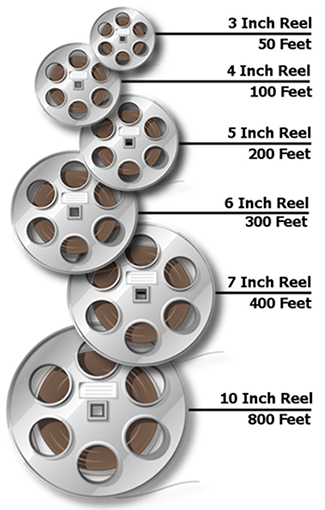 We use high definition film scanners (MovieStuff's Universal Retro's) to digitally scan and record the entire contents of each frame of your 8mm, Super 8mm and 16mm film. The captured film content is then reformatted / converted, and returned to you as a high definition movie on Blu-ray Disc. The finished movie has a 1920 x 1080p resolution, in a 16 x 9 aspect ratio, at 17 to 18 frames per second (fps) for silent film and 24fps for film with sound tracks. Our film scanners' frame-by-frame scanning of each film frame provides a superior, flicker-free movie. Pricing: Film Transfer Pricing is 20 cents per film foot ($0.20/ft). This price includes conversion of your film to Blu-ray Disc, a 90 day warranty, and 90 day backup protection. Extras: We offer options for background music ($10), on-screen titles ($5 each), basic color correction ($50), and extra copies of the final Blu-ray Disc ($15 per extra copy). Warranty - If we make a mistake, we provide a 90 day warranty on our work for editing changes or redo's if necessary. Our intent is for you to be satisfied with the finished product. All finished jobs are placed in network storage for 90 days as protection against loss or damage to the original order, or if the customer wants further editing or extra copies. Replacement cost is $25 for each replacement Blu-ray Disc. From Chad Sutton of Scranton, Pennsylvania on 8/27/2013 . I gave them a challenge, and they converted it! 50 year old 8 mm cine from a foreign country made into sharp DVD and BluRay discs. Viewing looks as if the projector from 2 generations ago were showing movies on the silver screen right before your eyes. I am sending them the other unique irreplaceable movies now. From Mike of St. Louis, Missouri on 5/2/2013 .